A Year Like No Other – an early season duck hunt in Cerro Gordo County, 1979. Back row [left to right] Lowell Washburn, Earl Leaman, Sterling Washburn, Leonard Washburn, Ed Kotz, Jr. / Front row – Sandy the Chesapeake & Shad the Lab Photo By: Ed Kotz, Sr. Duck hunters love to reminisce. Recounting the great hunts of yesteryear is a popular and time-honored tradition. Determining exactly which hunting season ranks above all others is purely a matter of perspective and is largely dependent upon when and where a person hunted. Having had the good fortune of hunting ducks in Iowa for 59 seasons, you’d think I’d have some difficulty in picking one single year as the all-time best. Fact is, I don’t. For me, answer is simple. 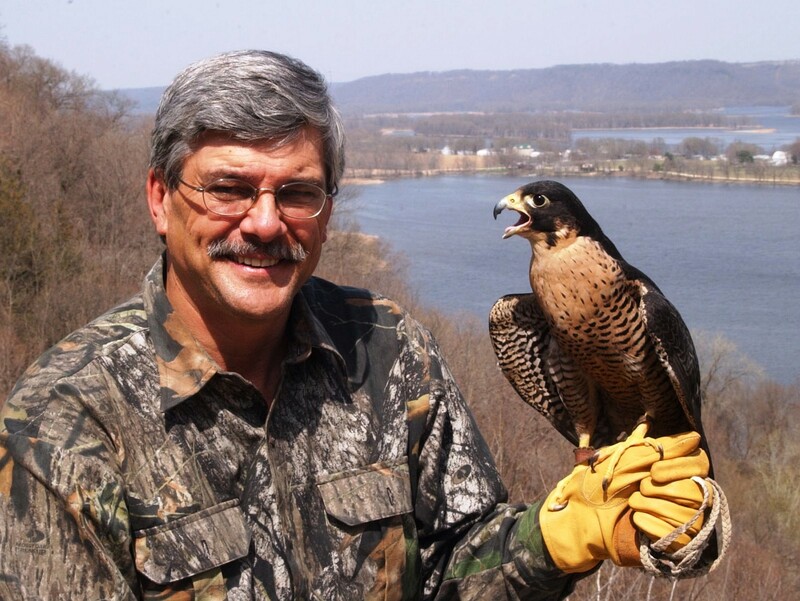 My Best Ever Iowa Duck Season occurred in 1979. I’m guessin’ that anyone else who happened to hunt in Iowa that year would say the same. 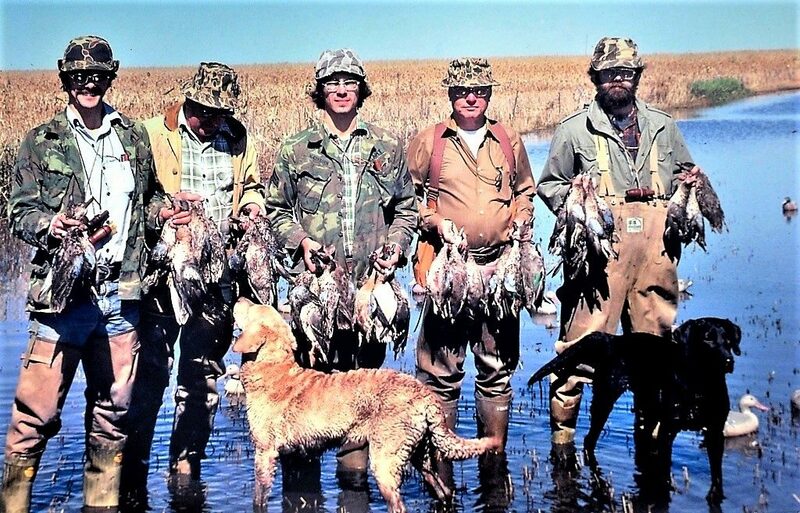 For Iowa waterfowl enthusiasts, 1979 provided a perfect storm where several factors simultaneously contributed to making the season so uniquely memorable. Season lengths were liberal as were daily bag limits. Iowa was under the federal point system where an individual point value was assigned to each duck species. The daily limit was attained when the bag’s combined point values reached or exceeded 100 points. Many species – teal, pintails, wigeon, gadwall, scaup and others — had a value of 10 points; meaning the daily limit for those species was ten ducks per day. As if that weren’t enough, the Iowa Conservation Commission had decided to enhance recreational opportunities even further by approving a first of its kind five-day, all species duck season set to open on September 22. But regardless of favorable season lengths and liberal daily limits; successful duck seasons are dependent upon hunters finding ducks. By mid-summer, it already appeared as if that critical requirement would easily be met. 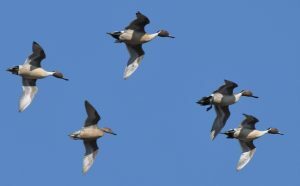 In prairie Canada, excellent habitat conditions and high spring nesting success had provided a virtual guarantee that, when autumn winds blew, eye popping flights of waterfowl would be moving south. Finally, in a weather event similar to this year, excessive late season rainfall had left the Iowa landscape pockmarked with untold of acres of sheet water ponds. For southbound ducks, Iowa would present an enticing mosaic of ideal wetland habitat and endless food. Hope for the impending season became even more encouraging when prior to the September 22 opener, thousands of migrating blue-winged teal began pouring into the state. Numbers continued to build until ponds literally blackened with resting teal. Significant numbers of mallards, wood ducks, wigeon, shovelers, and pintail only served to sweeten the pot. With only days to go, the stage was set for an opening weekend the likes of which few contemporaries had ever witnessed. Opening Day –September 22, 1979: Following weeks of anticipation, the Saturday duck opener finally arrived. Our seven-person hunting party had gained permission to hunt a shallow wetland located a couple miles north of Northern Iowa’s Ventura Marsh. Wading into the pond, we used our grass duck boat blinds to construct a long and comfortable, A-framed hide. At the first hint of daylight, flocks of ducks began buzzing the pond. Some splashed into the decoys, while many continued on. As shooting time drew near, I poured some coffee and set the cup on the edge of my seat. At the precise moment the legal time arrived, a tightly knotted band of teal came scorching toward the decoys. Someone called the shot, and my cup went flying as we rose to greet the flock with a seven-gun salute. The reason I mention the coffee is because that was as close as I ever came to taking a sip of that Morning Joe. It had been a hunt like no other – a Barn Burner opener that had exceeded all expectations. I later talked to Old Timers who had hunted during Glory Days of the 1940s and ‘50s who told me they could not recall ever seeing so many ducks in one place at one time. But the fun was just beginning. The ‘79 season quickly proved to be far more than an Opening Day, one-shot wonder. As the fall progressed, the incredible flights continued as blue-winged teal were replaced by migrating flocks of mallards, gadwall, green-wings and wigeon. Pintail migrations were the best in memory. Winnebago county held some of the highest concentrations, and it was not uncommon for hunters to leave the water with ten pintail daily limits – an event virtually unheard of before or since. The story continues: All good things must end, of course. The Iowa duck season concluded on December 3rd, leaving hunters with fond memories and a freezer full of duck dinners. Later that winter, I was hunting pheasants in a snowy stubble field with Sandy, my Chesapeake retriever. Coming over a hilltop, I spotted a patch of standing corn in the basin below. A reminder of the previous fall, the corn was occupying a spot where temporary flooding had prevented the farmer from completely harvesting the low-lying grain. Thinking the tall stalks might hold a rooster or two, the dog and I ambled toward the basin. Turned out there weren’t any pheasants; most likely because there wasn’t any food. Examining the standing stalks, I was amazed to discover that each and every husk contained nothing more than a bare cob. The empty husks told the tale. As migrating ducks had descended to the pond, the growing hordes had swum among the corn rows, eagerly devouring each and every kernel of corn. In terms of sheer numbers, the guzzling fowl must have presented an impressive sight. Equally amazing, was the fact that I had spent a good part of the fall hunting less than a mile from the spot and never had a clue that the secluded pond even existed. The pond had been just one of thousands scattered across the region. I couldn’t help but wonder how many thousands of ducks had paused to vacation in Iowa where, in spite of intense local hunting pressure, they had never even realized that a hunting season was in progress.